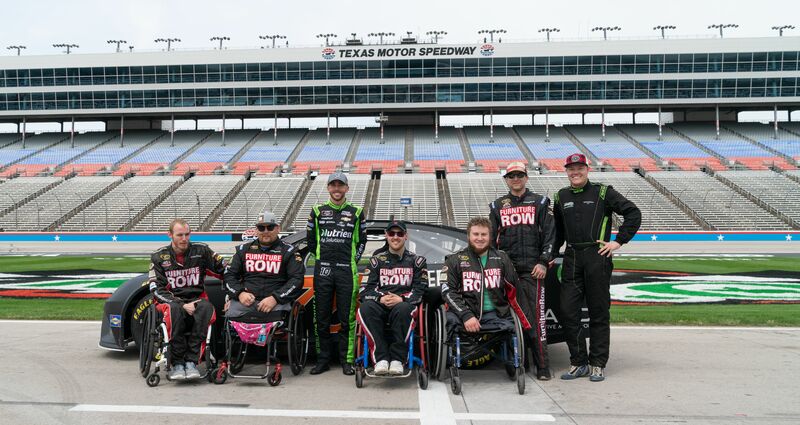 Falci Adaptive Motorsports provided an exhilarating experience for the mobility- challenged (amputees, spinal cord injured) Thursday, March 28 at Texas Motor Speedway in Fort Worth. Four of the participants who took part in the program – Dan French, Will Hoyum, Kevin Trimble and Lawrence Green — are U.S. Army veterans. French, Hoyum and Trimble suffered their injuries during their military service while Green’s injury was as a civilian after serving in Iraq. The fifth participant was Taylor Graham, a quadriplegic from Lincoln, Neb. The four U.S. Army veterans not only revealed their excitement to be at Texas Motor Speedway and driving a NASCAR race car, but also displayed the same kind of toughness, passion and grit as they did during their military service. Graham, a NASCAR fan, who passionately followed the Furniture Row Racing career, shared the same excitement as the Army veterans. The participants not only got a ride around the ultra-fast 1.5-mile oval by NASCAR driver Ross Chastain in an adaptive NASCAR race car, but also were able to drive the car, taking control of the car’s accelerator, steering and braking systems by applying only slight head-and-mouth movements or utilizing the specially-built hand controls. While they are Army buddies, there was still some intense competition on recording the fastest lap, especially between Hoyum and Trimble. Both participants drove the adaptive race car with speeds ranging from 119 to 123 miles per hour. While deployed in Afghanistan in 2012 with the 82ndAirborne division, Hoyum suffered a broken back, multiple fractured vertebrae and broken ribs when a string of IED’s (Improvised Explosive Device) detonated on his convoy. Trimble was also hit by an IED while serving in Afghanistan in 2011. At the time of the blast, Trimble was only a few feet away. The explosion resulted in Trimble losing both legs and his left arm. French suffered his injury in 2008. The Army E5 Sergeant was working under a vehicle when it slipped off its jack, falling on and pinning him, snapping his neck. Due to his incomplete spinal cord injury he was given a 99 percent chance of never walking again. But after years of rehabilitation he progressed from a power wheelchair, to a walker, to crutches and to now walking often unassisted or with a cane. Green, who served in Iraq as a wheeled vehicle mechanic in 2008, suffered his injury as a civilian in 2015 in a motorcycle accident. A reckless driver struck him head on. He spent one month in a medically induced coma and had both legs amputated above the knees. Green’s goal is to make the 2022 Paralympic team. Graham suffered a C6 vertebrae fracture in a motorcycle accident in 2013 that left him as an incomplete quadriplegic. After completing more than two years of inpatient and outpatient therapy, Graham received an associate degree in welding technology. He also became active in sports as a wheelchair tennis player and completed a 26.2 mile marathon using a handcycle. After his therapy he got married, and he and wife Hanna, are parents of two girls. “I don’t know how you put it into words. Whether they admit it or not, I think they were pretty nervous before we rolled out. They were all pretty calm when we were on the track and then when we would come onto pit road, they went crazy. If I can give them rides at 160 miles per hour as a way to give back for the service and sacrifice these guys have made, then it’s an honor. “The Texas Motor Speedway event was an awesome way to kick off our season opener for the 2019 Falci Adaptive Motorsports program of events. The car’s adaptive systems performed flawlessly and it was gratifying to see the smiles and the excitement by the participants who got the ride of their life at one of the fastest racetracks on the circuit. I walked away inspired after engaging with these brave and dedicated participants who refuse to accept defeat.